CAMBRIDGE, MA--(Marketwired - March 21, 2016) - Elsevier, a world-leading provider of scientific, technical and medical information products and services, today announced the publication of the second edition of Encyclopedia of Food Grains, an in-depth and authoritative reference covering all areas of grain science. 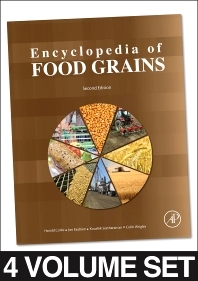 Edited by grain science and nutrition experts Colin Wrigley, Harold Corke, Koushik Seetharaman and Jonathan Faubion, the Encyclopedia is part of Elsevier's Reference Module in Food Science, an interdisciplinary and continuously evolving resource containing of thousands of Major Reference Work articles. It enables researchers and students to gain a broad understanding of a body of knowledge which is updated as science progresses. With the paramount role of cereals as a global food source, the Encyclopedia of Food Grains has become the standard reference work in the field of grain science. The four-volume second edition, also available online via ScienceDirect, covers everything from the genetics of grains to the commercial, economic and social aspects of this important food source. It includes the biology and chemistry of grains, the applied aspects of grain production and the processing of grains into various food and beverage products, with new content on celiac disease and gluten-free foods, fuel alcohol production, grain and nutrition, and pulse grains. Dr. Wrigley's 54 years in grain science research have earned him global recognition, including several international and Australian research awards. His work is described in some 600 research publications, and is highlighted by several patents, a series of eight books on Australian cereal varieties and many edited books. He was editor-in-chief of the first edition of the Encyclopedia of Grain Science in 2004. Dr. Corke is a professor in the Food and Nutritional Sciences program at The University of Hong Kong, and a Chutian Scholar Distinguished Foreign Professor in the Glyn O. Phillips Hydrocolloid Research Center at HUT, Hubei University of Technology, Wuhan, China. Active in grain processing and food safety consulting in Asia and Eastern Europe, he was one of the editors of the first edition of Encyclopedia of Grain Science. Dr. Jon Faubion is the Charles Singleton Professor of Baking and Cereal Science in the Department of Grain Science, Kansas State University. He is a senior editor of Cereal Chemistry, a member of the Board of Directors of the American Association of Cereal Chemists International, and an executive editor of Journal of the Science of Food and Agriculture. The late Dr. Seetharaman was the General Mills Cereal Research Chair and an associate professor in the Department of Food Science and Nutrition at the University of Minnesota. Before that, he held an industry research chair in cereal technology and was a professor at the University of Guelph in Guelph, Ontario. Elsevier uses proprietary tools to identify knowledge gaps in fields such as food science, nutrition and agricultural science. Editorial teams then strategically fill those gaps with content written by key influencers in the field, giving students, faculty and researchers the content they need to answer challenging questions and improve outcomes. These new books are key examples of how Elsevier is enabling science to drive innovation. The books are available on both the Elsevier Store and ScienceDirect, Elsevier's full-text scientific database offering journal articles and book chapters from over 2,500 peer-reviewed journals and more than 33,000 book titles. Elsevier announced the publication of the second edition of "Encyclopedia of Food Grains," an in-depth and authoritative reference covering all areas of grain science.